Inspired by the landscape of Iceland, the Glymur Poncho by Paula Leme is a stunning poncho with delicate eyelets that is universally flattering. Simple & satisfying, the poncho is knit top down starting with US 7, 24” circular needles for the ribbing. The body of the poncho is then continued with US 9, 32” circular needles (use needle to achieve gauge & feel free to increase circular cord length as you increase). 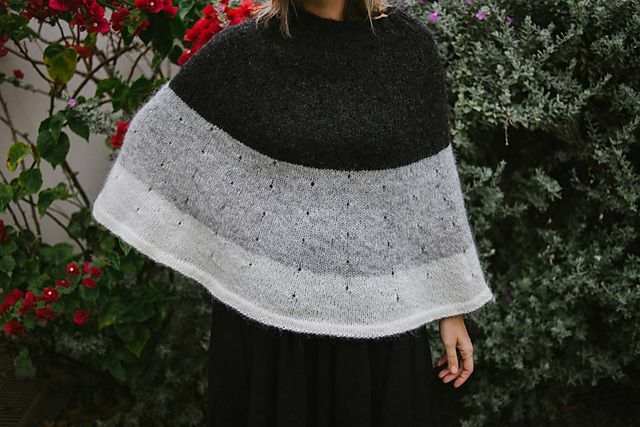 If you can do a make 1 & a yarn over, then you can knit this poncho! The poncho requires a total of 850 yards worsted or aran weight yarn. If doing a three color version, then you will need approx. 260 yards of color A (charcoal or black), 330 yards color B (medium to light grey), & 260 yards of color C (cream or white).